As we speed towards the cooler months, we Victorians might think it’s time to say goodbye to outdoor activities for a while. But this doesn’t have to be the case. Cold weather is all relative – and winter is the time of year when whales come up from Antarctica to breed and take advantage of our comparatively “warmer” waters in Bass Strait. So, now is the perfect time for whale-watching! Last year I went on a boat trip around the islands of Wilsons Promontory, and my eyes were opened to the magical and majestic underwater world that lives just on our doorstep this time of year. I thought I’d share with you a few snapshots from the day. First, we saw the Australasian Gannets (Morus serrator), plunging straight into the waves to catch fish. They were so quick, often you would just catch a splash out of the corner of your eye. Then came the pod of dolphins keeping pace with the boat and jumping above the waves. These Short-beaked Common Dolphins (Delphinus delphis) live in large pods (I couldn’t count how many we saw! ), and can be found in offshore waters around Australia. We then passed some Australian Fur Seals (Arctocephalus pusillus doriferus) lounging on the rocks in the intermittent sun and frolicking in the waves. Apparently when they “wave” their flipper in the air, it’s not to say hello - they are actually using the air to evaporate water and cool down their body temperature. But we were always on the lookout for those elusive creatures that had drawn us all there – the Humpback Whales (Megaptera novaeangliae). 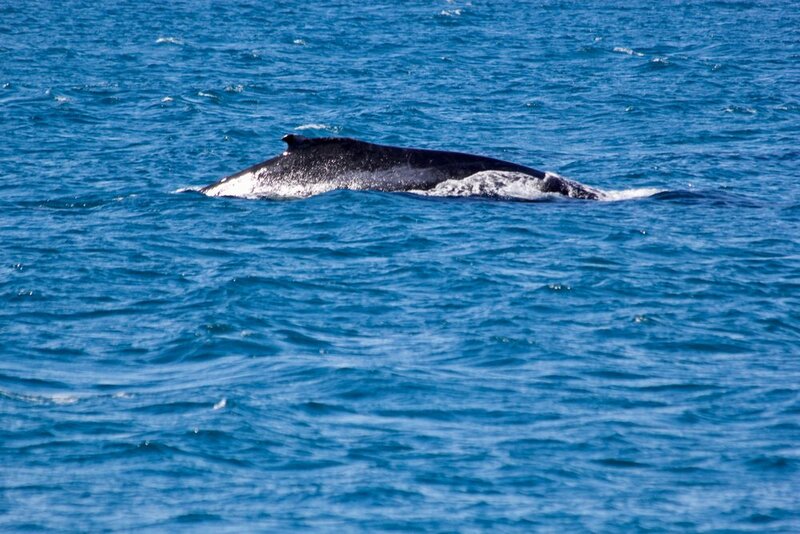 And finally, just peaking above the water, the back of a male humpback in the distance. Much still remains a mystery about these amazing creatures – they are arguably the hardest and most expensive vertebrate to work on because of their lifestyle, mobility and remote habitat. But catching a glimpse of one was truly a rare and exciting gift. Banner image courtesy of Ella Kelly. Recently, a deep-water reef was discovered at Victoria’s largest and most biodiverse marine park, Wilsons Promontory. This article is a guest post by Lauren Hall. Wilsons Promontory Marine National Park is the largest marine park in Victoria, approximately 220 kilometres south-east of Melbourne. It surrounds the southernmost tip of mainland Australia and is home to an extremely diverse range of marine wildlife and habitat types. This marine park is particularly unique due to its seagrass beds, unusual granite coastline, white sandy beaches and deep reef habitats abundant with colourful sea sponge gardens, stalked ascidians, fan-shaped gorgonian corals and diverse fish species. 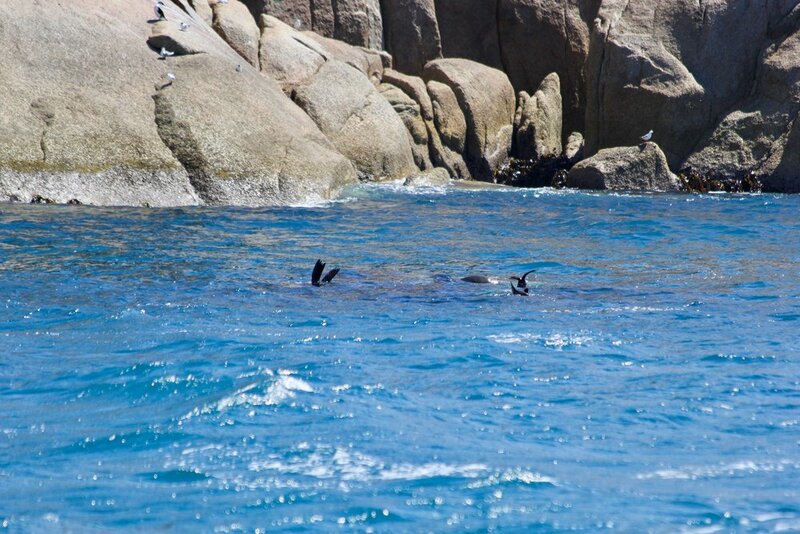 The park’s near-vertical granite cliffs, bright orange boulders, remote setting and frequently clear waters offer incredible diving, swimming, snorkeling and bird watching opportunities for all to enjoy. Compared to the rest of central Victoria’s marine parks, Wilsons Promontory has the highest biodiversity of fish species, with both cold temperate species from the south and warm water species from the north. This is due to the influence of the East Australian Current, which flows down the east coast of Australia from the Great Barrier Reef. Wilsons Promontory is therefore an exceptional place, as it marks the boundary between the warmer waters of the east Australian coast and the cold temperate waters of central and western Victoria. Many of the warmer fish species are brilliantly coloured, such as the red velvetfish, wrasse, eastern blue groper and magpie and butterfly perch. It is also a nationally significant area for the recovery of great white shark populations, as well as the hooded plover seabirds and the white-bellied sea eagles. The islands within the marine park are known to be important breeding grounds for little penguins, Australian fur seals and New Zealand fur seals. Other animals known to use the marine park include southern right whales, humpback whales, orcas, leatherback sea turtles, green sea turtles, bottlenose dolphins and even leopard seals from Antarctica. Wilsons Promontory Marine Park is more unique and diverse than ever imagined. As 90% of the marine park reaches depths of more than 20 metres, the full extent of its reef habitat has not been discovered until recently. In 2015, scientists decided to explore the unknown depths of its waters, which they suspected might house undisturbed and unique ecosystems. What they did not expect was the enormity of what they would find: an undisturbed, deep-water coral reef so diverse and teeming with life that it rivals even the Great Barrier Reef. Using Remote Operated Vehicles, or ROVs, scientists were able to explore these reefs at 30 to 100 metre depths, capturing footage of enormous colourful coral fans, sponge gardens and an abundance of fish species. The fish spotted in these reefs were as long as 80 cm and included rare species such as the Australian barracuda, indicating that these habitats are acting as a refuge for species struggling in more shallow Victorian waters. Also seen by the ROVs were sand dunes up to 30 metres high and two kilometres across, boulders as large as houses and 90-metre deep holes filled with schools of fish. Steffan Howe, Marine Science Manager from Parks Victoria, has said that the abundance of corals, sponges and fish species in these reefs are a particularly exciting find, especially as it is likely that there are never-before-seen species present. Although these ecosystems are too deep to access and are currently unmapped, Parks Victoria is keen to encourage divers to explore the region within recreational limits (down to 40 metres) in specifically marked areas yet to be identified. Through the help of recreational divers’ photographs and personal accounts, further discoveries could be made. Due to its depth and inaccessibility, Parks Victoria feel that it should attract minimal tourists, keeping the ecosystem relatively safe from most disturbances. Marine park authorities are currently gathering as much information as possible before allowing divers access to minimise potential impacts and stresses to the new ecosystem. As 90% of the plants and animals in these southern Victorian waters are found nowhere else in the world, it is imperative that this area is kept in its natural state. Marine pests are a major potential threat to an ecosystem such as this, so visitors should assist in the prevention of the spread of pests and diseases by washing all boating and swimming gear in fresh water before and after use within the park. Divers and boat operators should always be conscious of keeping a safe distance from all marine animals and plant life at all times. Access to the islands where the breeding of seabirds, little penguins and seals occurs is prohibited except for beach areas of the Great Glennie and Rabbit Islands. During the breeding season of the Australian fur seal, boats and other motorised PWCs are encouraged to keep well away from the islands, as they have been known to disturb breeding seal colonies in the past. Between August and April, it is particularly important to keep an eye out for the hooded plover: an endangered seabird known to nest on exposed beaches in Wilsons Promontory and elsewhere in Victoria. If you are not a diver or boat operator, you can enjoy the beauty of Wilsons Promontory by visiting its many secluded beaches, some of which are bright white and sandy, others grey and pebbly. Colourful granite boulders ranging from grey to light brown to bright orange, reminiscent of the Bay of Fires in Tasmania, can be found dispersed along the coastline and dotted along the beaches. The moderately easy two and a half hour hiking trail from Tidal River to Oberon Bay is a great way to explore the unique coastal habitats and secluded beaches along the way. Some of the best snorkeling can be found at Little Oberon Bay alongside the granite boulders and floating kelp where fish are abundant. The beaches along this trail also provide birdwatchers with many opportunities to see flocks of crested terns, sooty oystercatchers, silver gulls, short-tailed shearwaters, and the pacific gulls which only breed in this area of Victoria. Efforts must be made to minimise disturbances to this marine park. Whilst participating in water activities, it is imperative that care is taken to reduce damage from anchors, fins and intertidal trampling. The removal of flora and fauna is illegal throughout the national park. Thus, all visitors should be aware of park regulations and take away any leftover rubbish. Additionally, maintaining a safe distance of at least two metres from wildlife is vital so that animals and their habitats are not affected. The true joy of visiting places such as Wilsons Promontory is in seeing, exploring and taking away memories in the form of photography and experiences. Further exploration of this remarkable ecosystem is imperative in our quest to protect it. Our ability to communicate its wonders will play a vital role in conservation education so that future generations will continue to enjoy this spectacular marine and coastal wilderness.